Under the scorching heat of Cambodian sun lies the magnanimous ruins of world’s biggest religious architecture, The Angkor Wat. 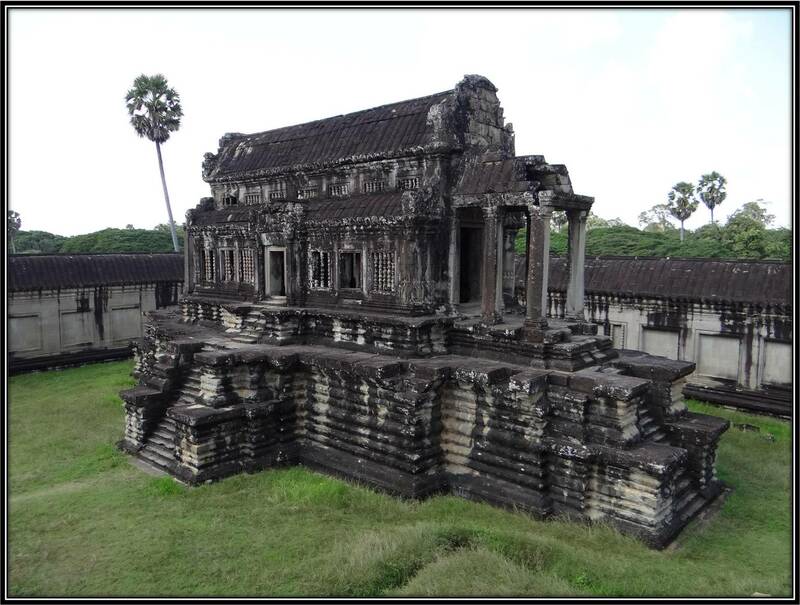 Hidden from the eyes of this world for almost 400 years, Angkor Wat shocked the human race when it was re-discovered by a French naturalist and explorer, Henri Mouhot. 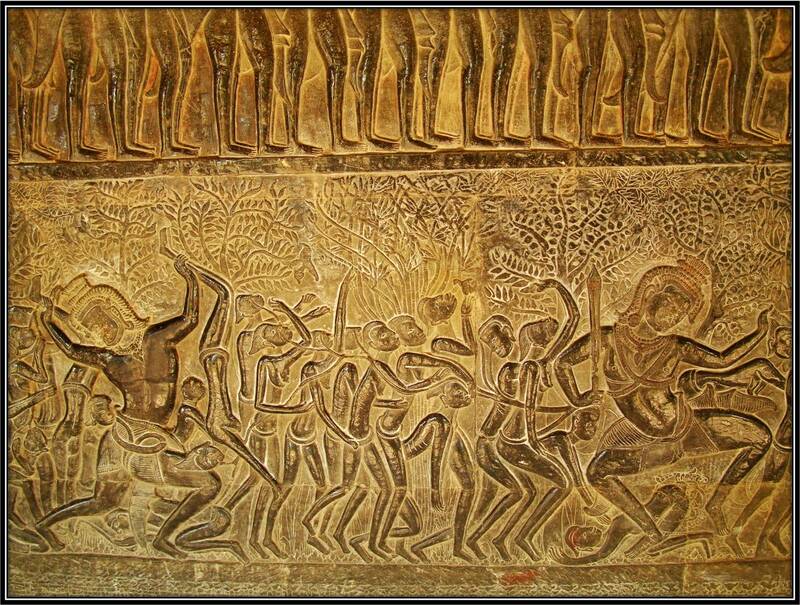 Although, Angkor Wat was always known to many local Khmer people and other westerners, but Henri Mouhot was the first person to take this marvel to the world through his elaborate journals and detailed sketches. Pardon my audacity to try and describe it in my story. The gallery on my right houses the ever so humble statue of eight armed Lord Vishnu, towering above our heads. This statue has been restored many times and is probably the only statue that is complete (well almost). Smoke rising from the incense sticks has filled up the space giving it a mystic aura. Someone has placed raw chicken to Lord Vishnu as an offering. In India, such offerings to Gods are unimaginable. I am seeing a new flavour of my own culture in a country across the Bay of Bengal. My pangs of excitement are leaping out of my pores because I am fulfilling a childhood dream of seeing The Angkor Wat. Outer periphery of the main temple complex is still about 400m ahead. I am standing on an old ramp of sandstone where King Suravarman II walked one thousand years ago. 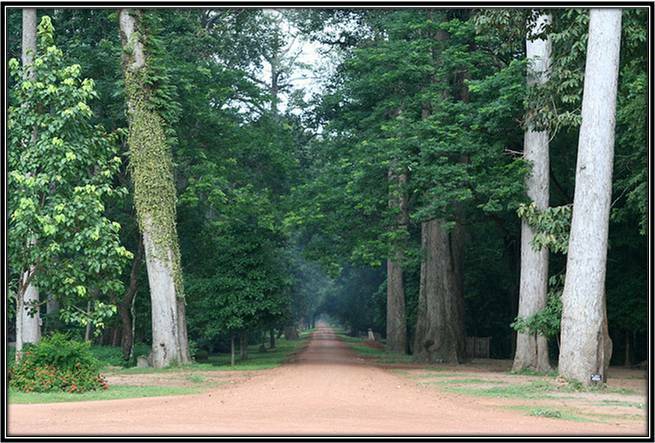 The green fields and trees around the temple was once a sprawling city. The jungle has now taken that city with it, leaving no traces. Every micron of this place is inspired by the Indian culture, architecture and religion. I am so proud; I am discovering my own self on this journey. Outermost galleries surrounding the main complex are sprawling with one of the most fabulous bas-reliefs I have ever seen in my life. 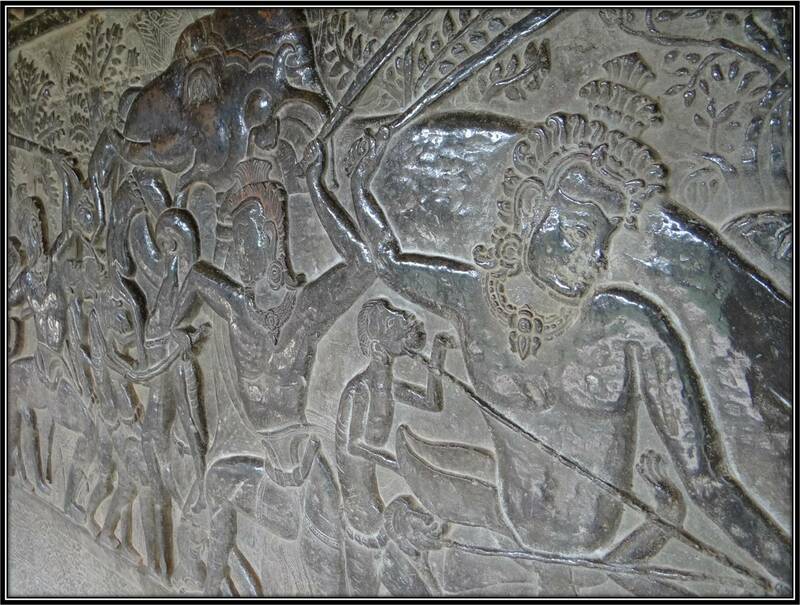 These bas-reliefs are representations of the stories from ‘Ramayana’ and ‘The Mahabharata’. 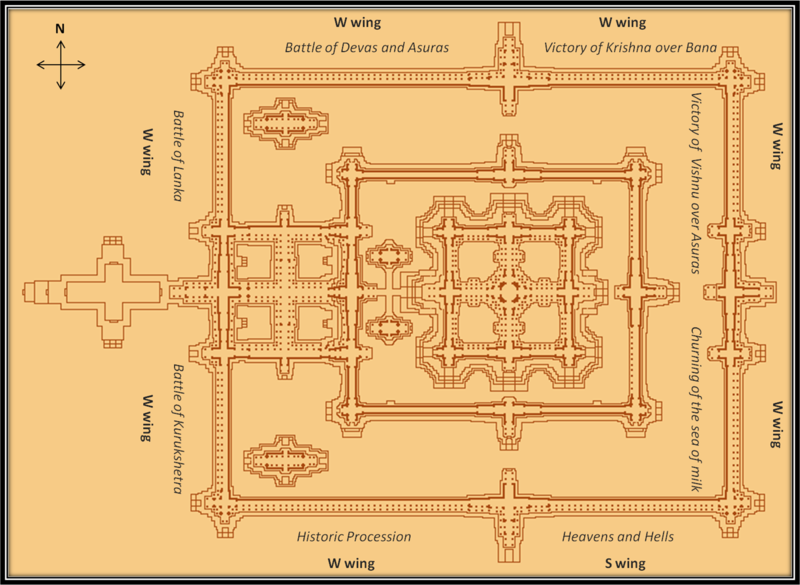 Battle of Lanka (W Gallery, N Section), is where Lord Rama defeats Ravana to rescue Sita. 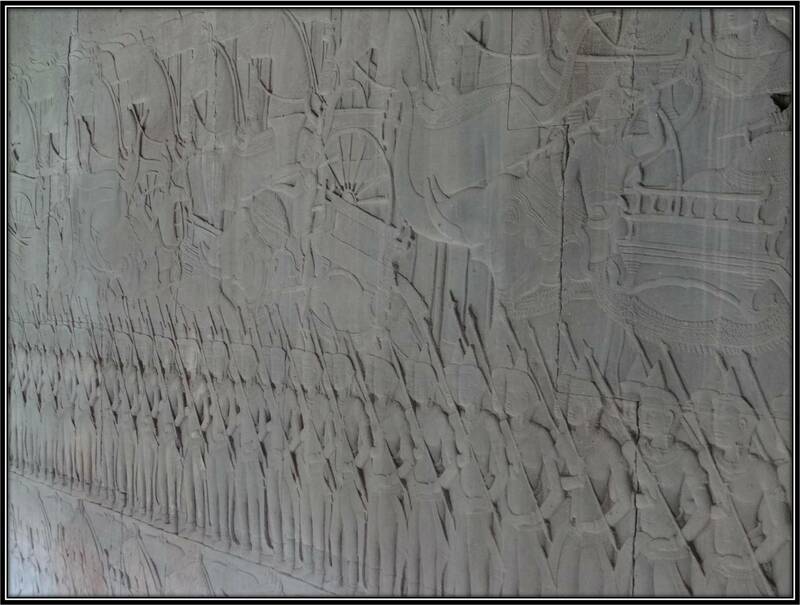 The standard of carving is excellent and I can clearly see the details of close hand-to-hand fighting. 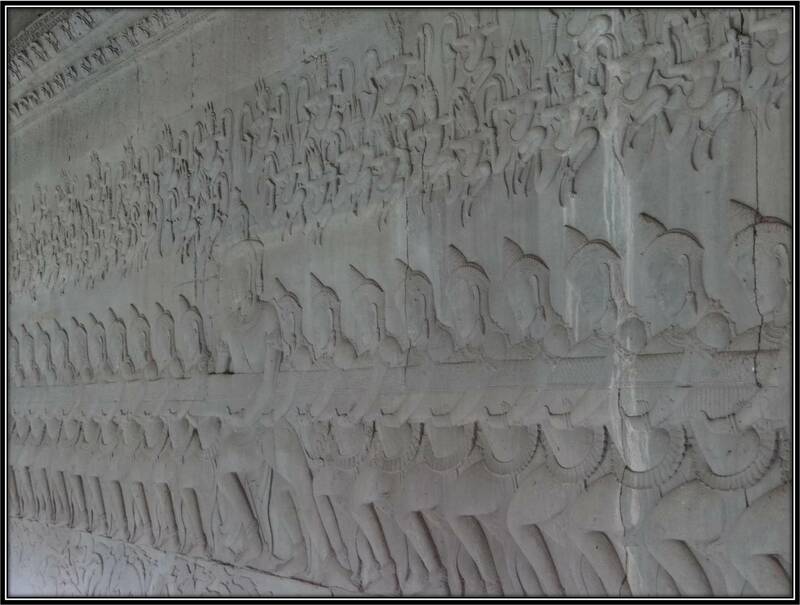 Battle of Kurukshetra (W Gallery, S Section), depicts the battle between two rival clans, Kauravas and Pandavas. The battle becomes more intense and hand-to-hand as I move towards the center. According to the Hindu mythology, the battle ends after 18 days, with all the combatants killed signifying the end of a Yuga, or world cycle. Churning of the Sea of Milk (E Gallery, N Section), is probably one of the most well known display of historic partnership between Gods and Devils to churn the sea of milk using Vasuki, the mighty naga, to obtain Amrita, the elixir of life. The Devils and Gods churn the sea for 1000 years. 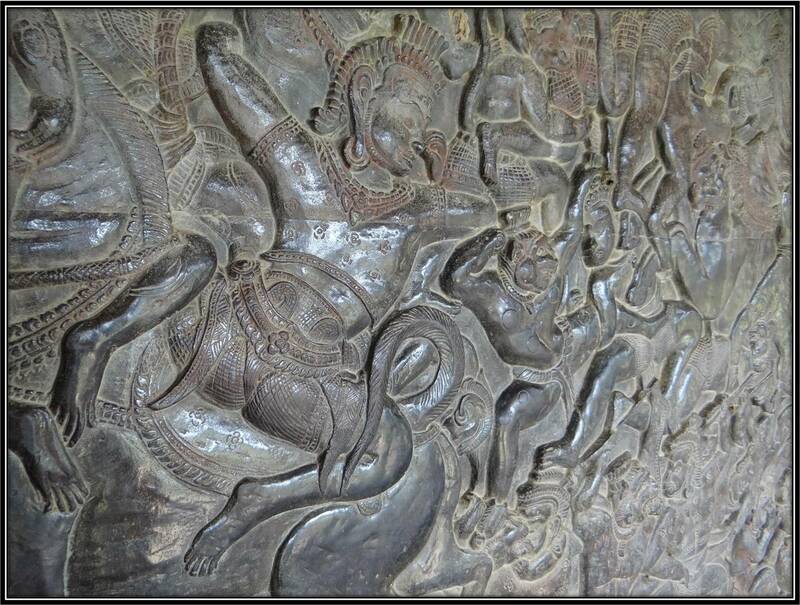 Devils are holding the head of Vasuki while the Gods hold the tail. Lord Vishnu is at the centre, directing the operations above his own Avatar in the form of a giant turtle. East gallery North wing shows the victory of Lord Vishnu over Asuras, while the Northern gallery shows victory of Lord Krishna over Bana in East wing, and battle of Devas and Asuras (Gods and Devils) in the West wing. The only gallery to show stories other than those from ancient Indian scriptures is in the south. South gallery Western wing shows a 94m long historic procession of the armies of King Suryavarman II. Eastern wing shows the Heavens and Hells. According to Hindu mythology there are 32 Hells specific to the sin and 37 Heavens. For instance, the 3rd hell, Vaitarani is where demons use long pincers to pull out the tongues of their victims. The 6th hell, Nirucchvasa is where the damned are slowly cooked; the burning lake of 9th, Taptalaksamaya; bone smashing in the 10th, Ashtibhanga. Krakaccheda, is where the gluttons are sawn in two, while Puyapurnahrada is where, “those who steal strong liquor, seduce others’ wives, go near the wives of scholars” are torn to pieces by birds of prey and thrown into a lake of slimy pus. In the 23rd hell, Kalasutra, demons roast a man on a spit. The 29th is Cita, the frozen hell, where I see thieves shivering. The hell of Maharaurava is where victims are tied to frames, and nails are hammered into their entire body. Unlike other temples, Angkor Wat faces West. Most archaeologists justify this by saying that King Suryavarman wanted this to be his mausoleum eventually. 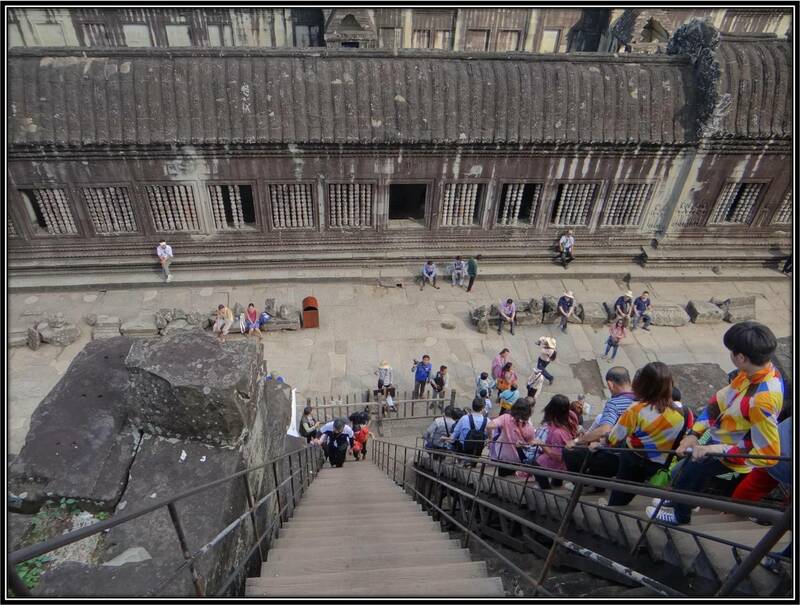 Angkor Wat, which is dedicated to the Hindu god Vishnu is a recreation of heaven on earth. This is not just symbolic wishfull thinking. Angkor Wat is above all else, a microcosm of the Hindu universe. The moat surrounding the complex represents mythical oceans surrounding the earth and the succession of concentric galleries represent mountain ranges that surround Mt. Meru, home of the gods. The towers represent mountain’s peaks, and the experience of ascent to the central shrine is, maybe intentionally, a fairly convincing imitation of climbing a real mountain. In present day, with all the modern technology it would take about 300 years to build such a structure. I am stunned to hear that 1000 years ago it was completed within a span of 32 years. I planned to see Angkor Wat in half a day, but it is already past afternoon and I have not even gone beyond the outer galleries. I still haven’t seen changing colours of The Angkorian Sunrise. Access to the inner periphery is via Gallery of The Thousand Buddhas with a huge library each on its left and right. Upon Angkor Wat’s rediscovery, the local people misunderstood it to be a place of Buddhist worship and started placing idols of Lord Buddha. Most of the Buddha’s statues have now been removed from the gallery. I should take a break now and sit for a while, catch up some breath and drink water. I am looking at a carved Apsara in front of me. I wonder what was on the artist’s mind while he chipped away from a block of stone whatever wasn’t this Apsara, I wonder what were his feeings and emotions, I wonder who he was, what was his name, where did he go, are there still descendents of his family around on the streets of Siem Reap or did they dissapear into oblivion at some point in time. My body is here, but my mind is time travelling over the last ten centuries. Everybody knows who King Suryavarman was, but nobody does, and probably will never know who this lady with a gentle smile, breathing through the stone is. Who is this lady from whose beauty even the Gods may hide in shame? Some questions have their own charm because they can never be answered. I see some children playing nearby. Every place teaches something new. I see happiness on these little faces. Happiness that does not come with money but is far beyond. A happiness that is given to us by God which we loose somewhere while growing up. I loose my tiredness after spending 15 minutes with them. Children are not said to be incarnations of God for no reason. I had a hard time choosing which photo to share with you. All have such beautiful expressions. Climbing the last steps towards Mt. Meru’s central quincunx is a mammoth task, and should it not be? After all, I am ascending towards heaven and I am still alive. I am climbing the steps slowly, experiencing each and every feeling. My journey towards heaven leaves me dizzy. I can see spectacular views of the forest and ancient roads leading into cities that once existed where there is now only dust. The roads on which horses once galloped, traders from far east, europe and middle east arrived with dried fruit and silver are now silent, screaming their stories to those who listen. The journey to Angkor Wat has made me a better person. I now know that there is no significance attached to who I am or what I achieve. I am just a speck of dust passing through the eons of time. Nothing is permanent. Even the most massive empires that were perceived as indestructible, ultimately merged with the soil from which they were once built. 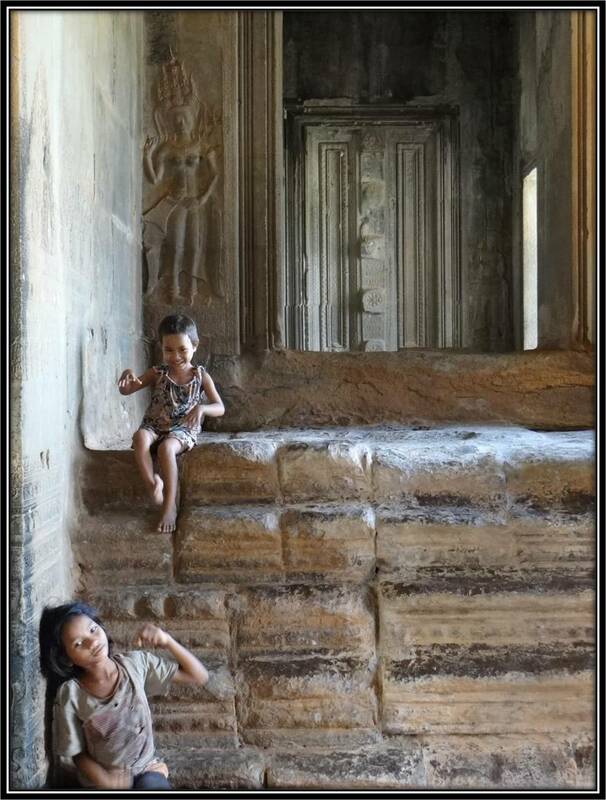 Have you seen the Angkor Wat? Add something that we don’t know about this place.